Equally adaptable for all target types and ground conditions Just select your detecting location and go! With innovative NEW multi-frequency technology, the EQUINOX Series redefines all-purpose detecting for the serious enthusiast. Equally adaptable for all target types and ground conditions, just set your detecting location and go! The clear LCD features large Target ID numbers so you can see your target ID at a glance. All of the information you need when detecting is right there in front of you. Detect Modes and operating frequency can be instantly changed at the push of a button for a dynamic and uninterrupted detecting experience. Using the EQUINOX 600 user interface, you can. Change the Detect Mode, Frequency and Sensitivity on the go. Create your own notch discrimination patterns to ignore unwanted targets. Activate All-Metal mode to temporarily disable the current discrimination pattern. Activate Pinpoint mode to zero-in on a promising target so that you know exactly where to dig. Adjust an array of essential and advanced detecting functions including Noise Cancel, Ground Balance, Volume Adjust, Threshold Level, Target Tone, Accept / Reject and Recovery Speed. View the status of your battery and wireless audio device connections. Low frequencies give more depth on large targets, and high frequencies are usually more sensitive to small targets. With EQUINOX you can operate across the full spectrum of frequencies simultaneously for maximum results. 6 (2 per Detect Mode). 1.34 kg (2.96 lbs). 11-inch Double-D Smart coil with skidplate (waterproof to 3m/10'). In-built loudspeaker 3.5mm (1/8) headphones (included) Bluetooth compatible WM 08 Wi-Stream compatible. Wired 3.5mm (1/8) headphones (non waterproof). USB Charging cable (1.5A), Multi Language Screen protectors. Yes, via USB connection (Windows and OSX). 3 years control box and coil. 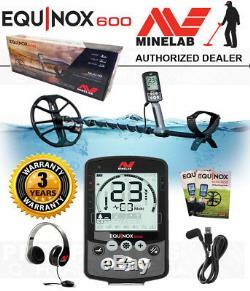 Includes NEW Minelab EQUINOX 600, Control Box, Armrest, EQX 11 Double-D Smart Coil with Skidplate(waterproof), Multi-Language Screen Protectors. True intelligent Simultaneous Multi-Frequency for maximum performance, plus a wide range of single frequencies. Compatible with ultra-fast wireless audio with the WM 08, and fast aptX Low Latency / Bluetooth headphones. EQUINOX is fully submersible, ideal for detecting at the beach and in rivers, streams and lakes. Each Detect Mode features 2 custom Search Profiles so you can save your favourite settings in each mode. Rugged and lightweight construction allows you to enjoy long detecting sessions in any environment. Fast & Accurate Target ID. Fast recovery speed with accurate Target ID ensures you wont miss any valuable targets amongst the trash. Equally adaptable for all target types and ground conditions just select your detecting location and go! Great for high-trash recreational areas, including most general detecting. Ideal for detecting in historical fields for the widest range of target sizes. Optimised for all salty conditions dry sand, wet sand, surf, underwater. 20 kHz and 40 kHz are not available as single operating frequencies in EQUINOX 600. The Multi-IQ frequency range shown applies to both EQUINOX 600 and 800. This diagram is representative only. Actual sensitivity levels will depend upon target types and sizes, ground conditions and detector settings. EQUINOX 600 offers 3 single frequencies of 5, 10, and 15 kHz, giving a 3-times range of 5 to 15 kHz. Maximum wireless audio compatibility - Connect conventional Bluetooth headphones, high-speed aptX Low Latency devices, or the ultra-fast Wi-Stream enabled WM 08 audio module. 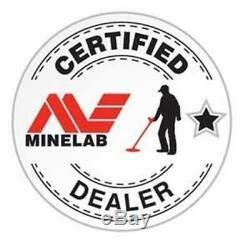 The item "MINELAB EQUINOX 600 METAL DETECTOR 3 YEAR WARRANTY + Accessories" is in sale since Monday, July 16, 2018. This item is in the category "Business & Industrial\Test, Measurement & Inspection\Test Meters & Detectors\Metal Detectors". The seller is "prospectingchannel" and is located in Oroville, California. This item can be shipped to United States.